In the 1860’s the population of the area known as Ascot Heath had reached around 1,350. It was dotted with a few Victorian villas, mansions, often seats of minor nobility, and surrounded on the one hand by the farms and estates of local gentry, and on the other by the many sub-divisions of Windsor Forest belonging to the Crown. The Royal Kennels, the Royal Nursery (plants for royal gardens) and the London and Ascot Convalescent Hospital, (Ascot Heath was noted for its air and bracing climate) were prominent local establishments. The racecourse, which is very close to the church, set up in Queen Anne’s time, some hundred years earlier, had, with Queen Victoria’s patronage, grown in popularity. Apart from those working there and on the land, given the number of villas and mansions, local people were mainly employed as domestic servants, tradesmen and craftsmen. Prior to the building of All Saints’, the nearest church was St. Peter’s at Cranbourne, 3 miles away, a tidy trek for those without carriages, and it appears that the then Vicar of Cranbourne had a big hand in getting a new church built here at Ascot. Work began on All Saints’ in 1863 and was completed in 1864. The Lord Bishop of Oxford, Bishop Wilberforce, consecrated the new church on May 26th of that year. 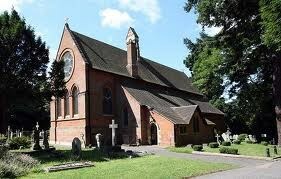 At the time, this area was part of the ecclesiastical parish of Cranbourne but with the advent of the new Church, in March 1865, an ecclesiastical parish of Ascot Heath was formed from parts of the civil parishes of Sunninghill and Winkfield. All Saints’ was designed by a Mr. T.H. Rushforth and built by a local builder, Joseph Norris. Initially, it cost £2200 to build, most of which was contributed voluntarily. Later additions: the porch by the main entrance, a Parsonage, eventually Rectories, added to the cost. The design provided for seating for 246 persons - 181 designated as free pews. The church was enlarged in 1870 to provide for a north aisle, which now leads into the choir vestry, added around 1890. N51 24.ABC W000 41.DEF, which is just a short walk away.